At Nicolet FEAR we take safety seriously. We have received six different safety awards, and are the inventors of the now widely adopted Zip Tie Certification System. The Safety Corrective Action Plan is a form filled out after every accident, as a way to ensure mistakes are always learned from. Accidents and incidents are going to happen in any workspace, so our procedure is designed to turn this inevitability into a valuable learning experience by dissecting why it happened and how it can be prevented. Our Safety Data Sheets provide a convenient way to ensure that not only do we have all the necessary tools, gear, and equipment, but that it is all neatly and accessibly arranged. Team members can quickly and easily check that everything is properly packed. 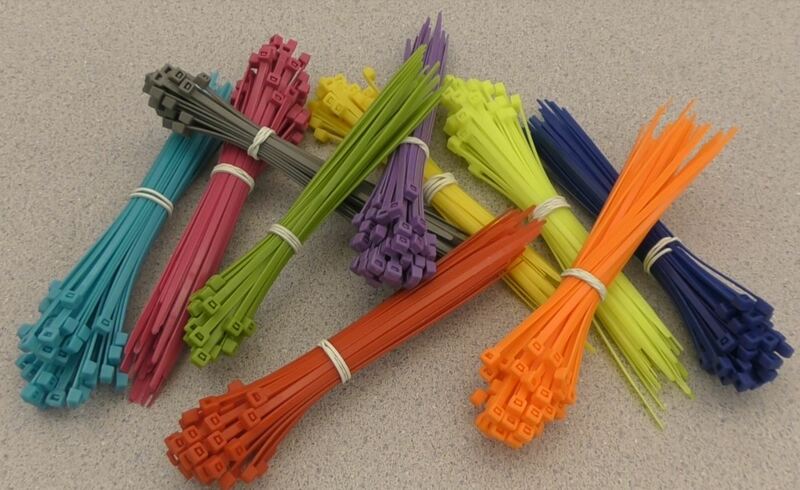 When a student has qualified for certification on equipment, they are issued a zip tie with the correct color designation. This allows mentors and other students to easily assess whether someone has the training to safely manage any given tool. Methods of certification vary. For some ties, the ones more about general best practices in lab environments, it is considered sufficient to attend a seminar and then sign a contract acknowledging you were present to pay attention to what you learned. Ties related to usage of specific tools or tool types often require a demonstration of ability before they are dispensed. Our Zip Tie Certification System is good because of the ease and efficiency it communicates with. Once a student is trained fully on how to safely and effectively use a tool, the zip tie ensures everyone knows. It makes it easy and quick to identify who has been trained and can safely use what tools, while subtly enforcing proper usage of PPE (Personal Protective Equipment). If you are not wearing your glasses, you are not qualified to enter the lab. There is no need to constantly cross reference a sheet or list recording which students can use what tools, as all students wear their certifications clearly on their glasses. Communication of ability is easy, clear and nonverbal, important traits for a noisy, lab based environment. Clarity of communications is a vital component of lab safety, especially when it comes to qualifications. 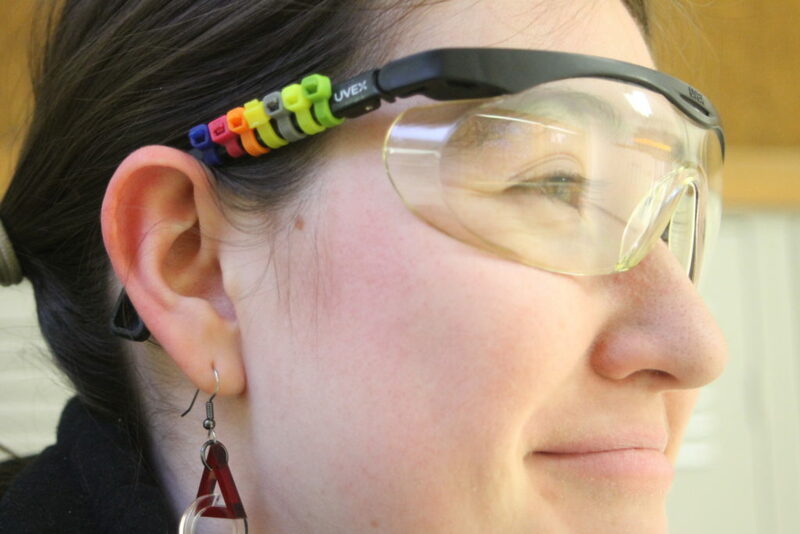 The Zip Tie Certification System is inexpensive to use, requiring only a pair of safety glasses (already a must-have for all lab workers) and zip tie. A multipack of all required colors for our system can be bought on Amazon for under fifteen dollars. Zip ties are also durable and will last the whole season. 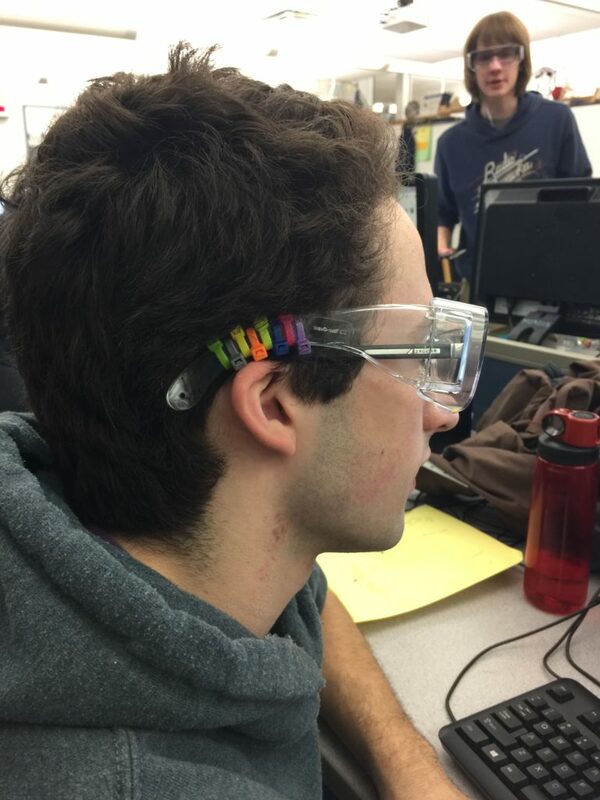 Green zip ties are basic, and mean that this student knows how to properly equip their Personal Protective Equipment, or PPE, and how to act in a safe manner in a lab environment. With this tie, a student can enter the lab. Gray is for hand tools, both powered and non-powered. It includes tools such as drills, screwdrivers, files, and center punches. Yellow is for electrical safety, meaning the knowledge of how to act around wiring, active electrical outlets and working circuits. Neon Yellow is for the drill press, certifying the team member to safely use it to make holes in wood, metal, and polycarbonate. Orange indicates proficiency in the first group of tools used to slice and sever materials, including the Miter, Table, Band, Scroll, and Panel Saws. This team member is part of the Business Department, a Team Relations department. She will likely not use any of these tools during the season, being occupied working on our merchandise, slogans, and other branding aspects of our team. 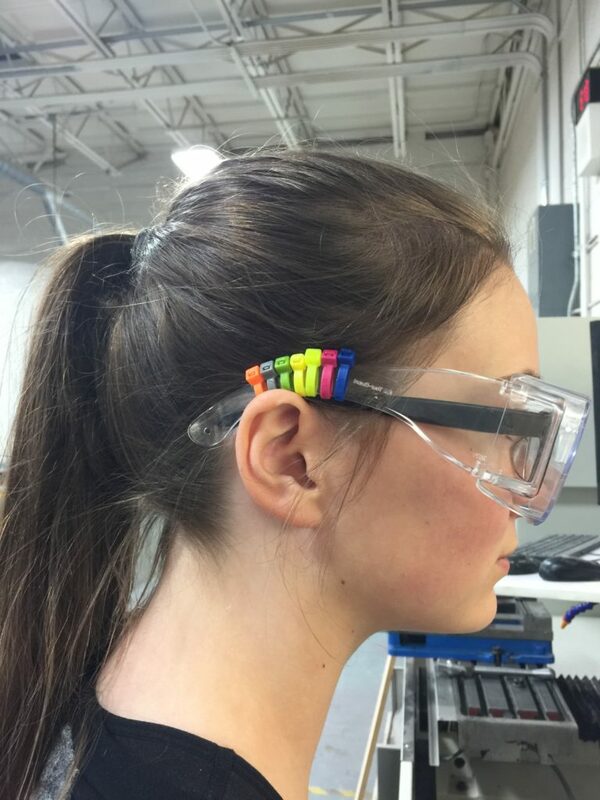 However, like all of our team, she has all of the basic level zip tie, and has even gone above and beyond to get some intermediate ones. Dark Blue is for the second group of tools for separation, including the Grind Wheel, Ferrous Chop, Horizontal Band Saw, and the Aluminum Chop Saw. Magenta is for Cold Forming, machines used to bend and manipulate metal without heating it. This team member is a part of the Robot Design and Manufacture Department, a Robot Construction Department. As such, she will spend the entire season either designing or constructing the robot, except when recruited for mandatory Button Making Duty. The Basic and Intermediate Levels, both of which she has completed, cover all the tools an average team member will have cause to use. Purple is for Welding, operations using the Plasma Cutter and SMAW and GMAW welding techniques. This team member is a part of the Robot Design and Manufacture Department, a Robot Construction Department. As such, he will spend the entire season either designing or constructing the robot, except when recruited for mandatory Button Making Duty. The Basic and Intermediate Levels, both of which he has completed, cover all the tools an average team member will have cause to use. His only Advanced Level zip tie is for a skill not commonly needed in the lab. Every year, only a handful students earn any one advanced tie, due to their high level of difficulty and low level of demand.